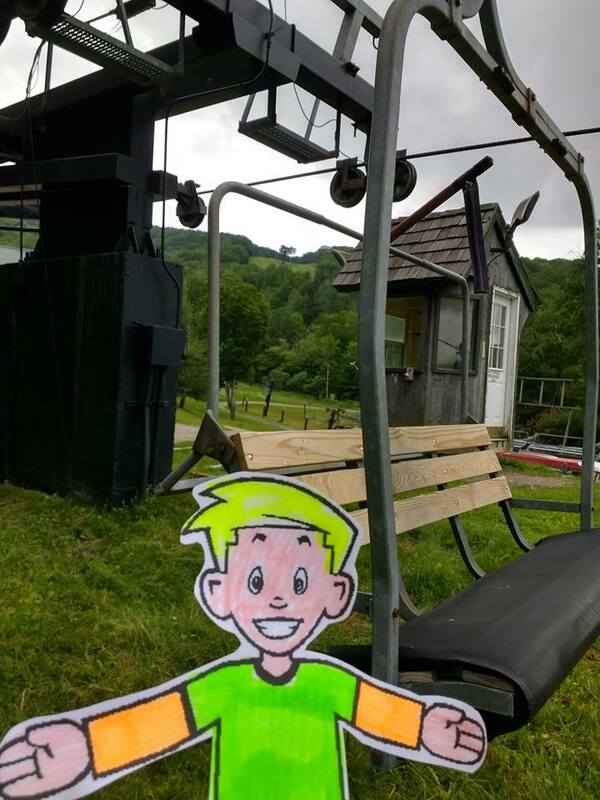 Flat Stanley wants to wish you all a VERY Happy Fourth of July! It’s a special day for our country. Independence day is a day to celebrate being an American by what we call patriotism. Nana loves the BBQ’s and fireworks and parades with flags flying high! In this parade, George Washington was on the grand finale’ float. It’s a big flowery flatbed of a truck that is decorated with fancy chairs for the parade stars to ride on. Flat Stanley saw George Washington and immediately recognized him as our first president. You know he wanted to, you know he had to; you know he DID! 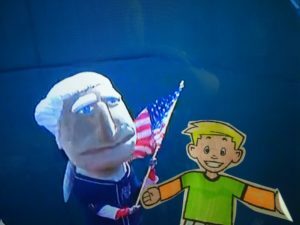 Flat Stanley jumped right up on that float and shook President George Washington’s hand. Nana went to get Flat Stanley down and overheard their conversation before taking him by the hand. “Well, Flat Stanley, I think there’s one thing all of us could do to make America better and better. Number one, I think is being kind to one another. Are you a kind person Flat Stanley?” George Washington asked him. George Washington smiled a happy smile as Nana helped Flat Stanley back to the street side, allowing the parade to continue. So, as you’re watching the fireworks, parades and enjoying BBQ’s today…try to think of how we can be better citizens of this great nation. I hope you enjoy doing what you love best today with family and friends. Nana enjoyed her day watching the Red Sox win! 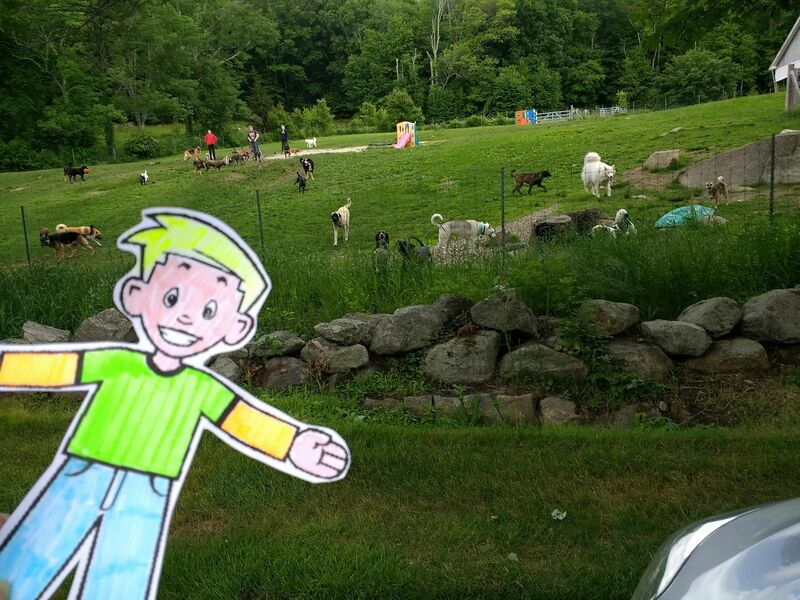 I will be on vacation this week, so please be on the lookout for more Flat Stanley stories to come next week! Flat Stanley Celebrates Briana’s Birthday! July 1st has come in hot as a tater tot straight out of the oven! New Englander’s aren’t used to this kind of heat! “This feels like Texas!” Auntie Terri declared. But it’s a day for BBQ and water sports, so let the fun begin! 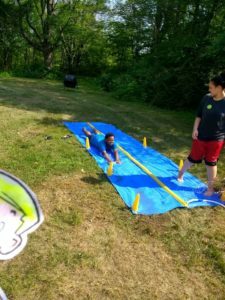 Slipping and a sliding Flat Stanley got a nice running jump and flung himself like a cherry from a slingshot straight across the slippery slip and slide! “Weeeeeeee!! !” The water sprayed in his ear so he had to shake his head to let it come out. Do you ever get water in your ears? It’s not a fun feeling, but it shook out fast and he was back up and ready to slide again! Briana’s friend Shay had her style down flying in like a goose on the loose. 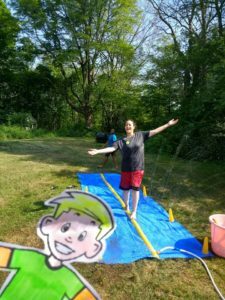 “Swishhhhh and sliiiiiiide” Shay cried as she flew across the slippery plastic. This was a fun birthday party! Flat Stanley liked his light up rings and fancy glow in the dark bling in the party bags. He helped Nana pick out the funnest stuff and the kids were having a blast. All that running, slipping and sliding made them hungry! Nana came out with a platter of watermelon and cantaloupe and the juice dripped down Flat Stanley’s chin, but he enjoyed every bite. The BBQ started smelling really good as his belly began to rumble and tumble. 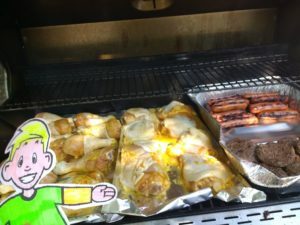 Flat Stanley went over to the grill and helped Uncle Dana, the Grill Master in Chief! Flat Stanley was a good assistant and was very careful not the let the flames get out of control. It was a hot, but very fun day for a birthday! 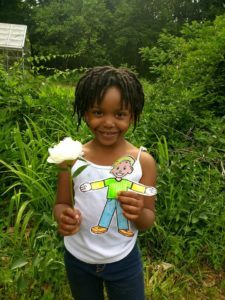 Flat Stanley was hot on the trail to Virginia again. He was missing his bestie Alexa and had to find a way. He heard the train rolling down the tracks and hopped aboard! “All aboard! !” The captain shouted. 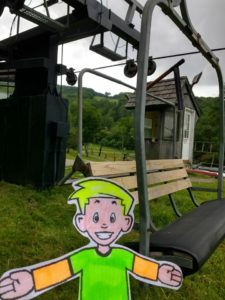 Flat Stanley waved his arms to signal his safe landing on the train; and he was off for another adventure! Alexa met him at the train station. The first thing she noticed is that he had lost his red suspenders. She loves those red suspenders on Flat Stanley; it’s his badge of honor for being such a great farmer and taking care of the chickens. Flat Stanley explained how well he’s been eating at Nana’s house and well, the suspenders just didn’t fit anymore. You know what Alexa did? She bought him new red suspenders! After shopping and dinner, they headed back to the house. Flat Stanley was so happy to be sporting his larger red suspenders! He missed them! 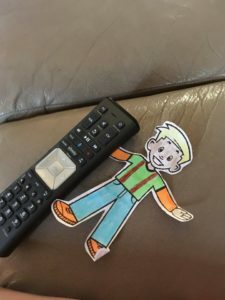 Flat Stanley climbed up on their big couch and grabbed the remote control. He loves clicking through the channels! He started with the cooking channel. He loves to watch chef’s create their masterpieces. Today he was wishing for taste-o-vision. He wanted to taste the bbq’d chicken! 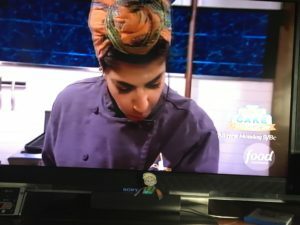 Alexa was getting hungry watching the cooking show too. She went into the kitchen and rummaged around for a nice snack. 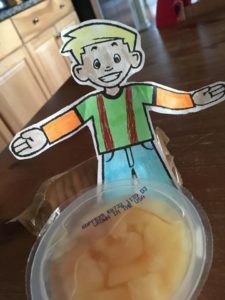 Flat Stanley enjoyed the fresh fruit! “Fruity Tutti, Fresh and Juicy,” Flat Stanley sang out. He made Alexa laugh. When they started cooking with sardines, Flat Stanley wrinkled his nose and Alexa copied him. Can you wrinkle your nose? 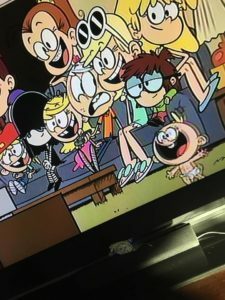 They changed the channel to something more fun! I don’t know what you call this, but it was LOUD and screechy! 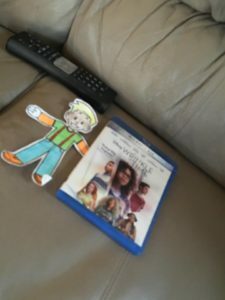 Flat Stanley decided it was movie time. Flat Stanley knew that “A Wrinkle in Time” is one of Alexa’s favorite movies. They watched the astral travelers travel to a far away planet with Mrs. Whatsit, Mrs. Who and Mrs. Which. They love watching this movie together. 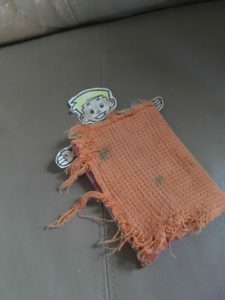 After the movie, Flat Stanley was tired, so Alexa tucked him in on the couch and you can see he was smiling really big. He loves spending time with his bestie. Nighty Night Bestie! I hope you wake up with that same smile on your face. I hope this finds you smiling too! 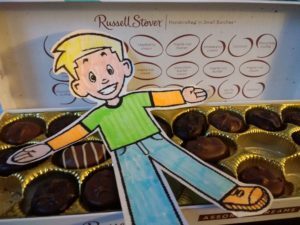 Please subscribe and share Flat Stanley’s Adventures with your family and friends. Smiles are meant to be passed along! 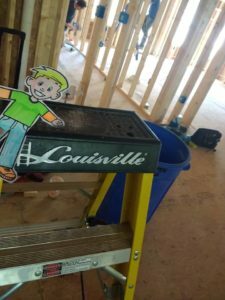 “Fire it up and let’s roll!” Flat Stanley said when he saw the electricians truck pull up in the yard next door to work on Nana and Papa’s new house. He went out and took care of the chickens, giving them fresh water and hay and collecting the eggs. Today he had dried mealworms and oyster shells as treats. They do love their treats, and happy chickens make for tasty eggs! 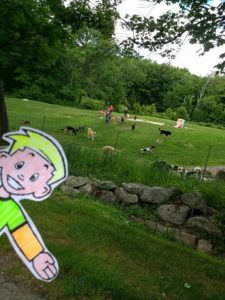 After compiling a dozen in a leftover egg tray that friends save for us, Flat Stanley trotted next door with a swing in his step. He was ready for adventure! “Hi guy! I’m Flat Stanley,” he announced to the first worker man he saw in the house. “Well hello there little man, I’m Elliot the Electrician!” he replied with a smile. “I brought you some fresh eggs, do you need any help in here?” said Flat Stanley. Flat Stanley was indeed a good worker. He helped him tie the blue line tight into the box that Nana’s washing machine will plug into soon. Then he had to do some work up high for the ceiling fan that will keep Nana and Papa cool in the summer. 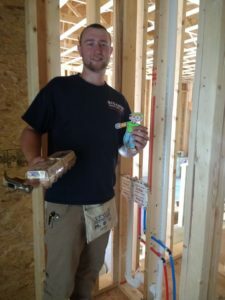 “Louisville slugger coming to the rescue,” Flat Stanley said with a smile as he joined the guys working on the ceiling wires. When he strung the wire way up high, it was a bit heavy for him and Swwiiisshhhh… down he came flying like a monkey on a trapeze wire. “Ahhhahahahahaaahhhhh” he hollared like Tarzan.” Do you know who Tarzan is? Well he lived in the jungle and swung from thick vines from tree to tree and he had this most particular shout he did as he flew through the air. Can you do that shout? “Whew…I think I’ll stick with the ground wiring.” Flat Stanley said after his flight through the air. So he got down on his knees like Theodore and began threading the wires through the electrical boxes with him. This is where Papa’s plugs will plug in his TV. Papa is excited about his new TV, he says every house should start off with a new TV, and the bigger the better for watching the Red Sox play! He loves his Red Sox baseball team. Do you have a favorite team? 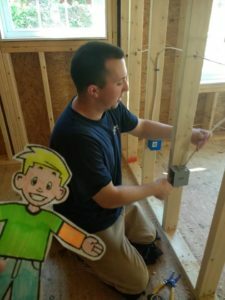 Today, Flat Stanley’s favorite team was Elliot’s Electric Company. They kept him safe and taught him a lot of new skills. 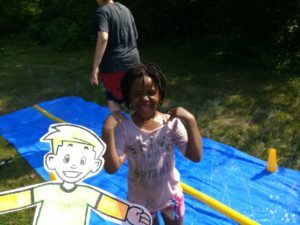 Flat Stanley was a really good helper and enjoyed the smiles the day brought. I hope this finds you smiling too. Enjoy your day and thank you for sharing Flat Stanley’s Adventures with your friends and family. 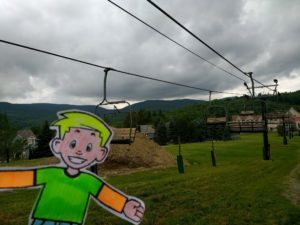 Flat Stanley was asking about the ski lift on the resort where Nana and Papa were staying. Nana explained that it’s summertime, but in the winter, when there’s snow covering the ground up here on the mountain; that skiers fly down the mountains. 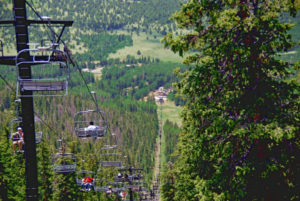 The ski lift has bench seats on a heavy wire that runs up and down the mountain. The lift carries skiers to the top of the mountain, they are let off at the top and the ski to the bottom. “When it’s summertime, you ride the lift for the view,” Nana explained. “I want to go!” Flat Stanley exclaimed with that high pitched excitement in his voice. Nana loves high places and Papa, well he breathes deep and plays along like he likes it. Do you like when you’re in really high places looking down? Flat Stanley decided he’d find out if he liked it. We all climbed aboard the bench seat that would take us for a ride to the top of the mountain. We started out low and slow on this cloudy day. It didn’t take long before the lift carried us to the top of the mountain up in the Berkshires of Massachusetts. We stayed on board and let it carry us back down. The view was amazing. Flat Stanley held on tight and giggled a lot. Papa breathed in big sighs, I’m not sure if he was really enjoying this. But Nana! She was pointing and shouting “look you can see the lake over there in the next town from up here!” “Look at those farm animals, the cows look like speckled frogs from up here!” It was amazing and Nana was loving the thrill! As they reached the bottom of the lift and stepped off, Papa’s feet got up under him and he swayed a bit, but he caught his balance and nodded. He’s a trooper. Flat Stanley held his hand to steady him as they walked back to the car. Flat Stanley was ready to ride again!! His smile was so big. I hope this finds you smiling too. Enjoy your day! Flat Stanley and Nana have one thing in common. They love to sing! Everywhere they go, they’re singing. Nana picks her loudest and most annoying songs to sing when she’s doing chores. If anyone complains, she says that it makes doing chores less humdrum (which is Nana’s silly way to say boring). “So, I’ll stop singing these annoying songs if you’d like to do my chores.” Everyone stops complaining then. When she finishes dinner and wants people to come to the table Nana has this really loud and screechy “oooooh it’s time for …. DINNNNAAAAAAAAAAAAHHHhhhhhhhhhhhhhh” that makes everyone come quickly, because if they don’t come, she keeps doing it. Again, and again…and again as needed. Usually it only takes one dinner call. 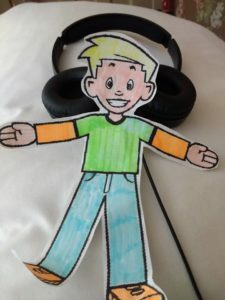 Flat Stanley’s favorite music is hip hop! He says it makes him hip and hop better. I think he’s right. The beat does make you move in your seat. He had his headphones on this morning and was singing really loud. When he took the headphones off, the song was still stuck in his head. Does this ever happen to you, when you hear a song and can’t get it out of your head for the rest of the day? Nana’s of course is anything by Bruce Springsteen, but she and Papa love all of that old rock that they call classic. 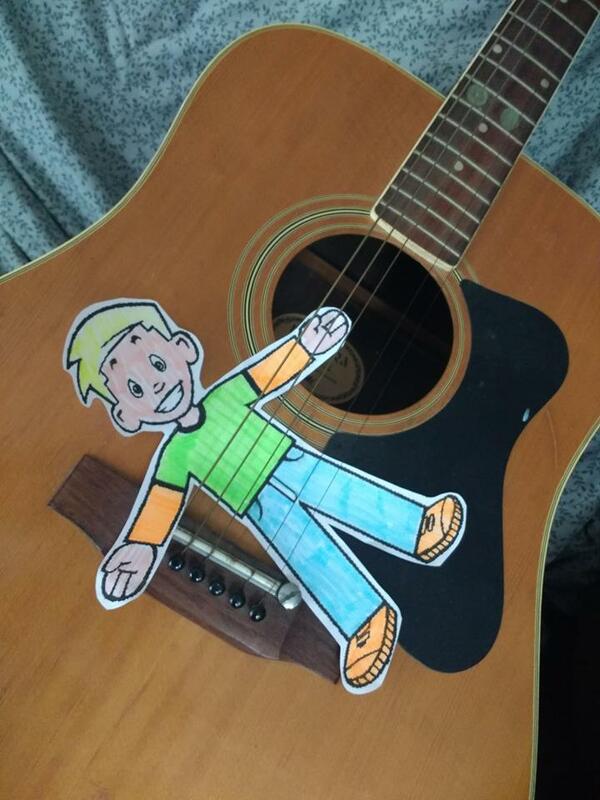 Flat Stanley likes to make up songs. He’ll get a nice backbeat playing in his head and the words just flow. His smile was so big as he was dancing around the kitchen. I hope this finds you smiling too! Have a nice night! Nana and Papa kept their promise to Grandma Great. They promised her last week that they would take her to go play BINGO this week. Keeping a promise is important to Nana and Papa. Do you keep your promises? It’s so very important that we try to follow through with what we say we’re going to do. When they pulled up to the bingo hall with Grandma Great, Papa was not a very happy man. He doesn’t like BINGO very much. But, he’s a trooper and likes to make others smile; so in he went. 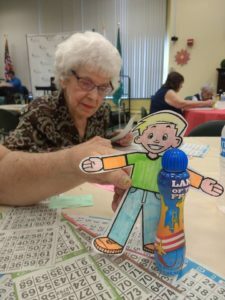 We bought our stack of BINGO cards and Flat Stanley helped Nana put the colored cards in the order of when each game will be played. The first game was on the blue bingo card and the last game was on the magenta colored card. Papa got the bingo dabbers out and began dotting all of the free spaces on the cards. 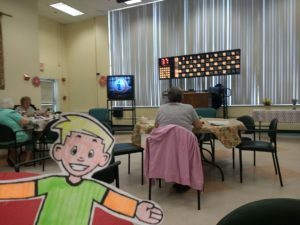 Flat Stanley liked this BINGO hall. There were a lot of nice ladies here at the senior center. They loved Flat Stanley and his silly ways. He decided to entertain them while they waited for BINGO to begin. What could be more fitting than the BINGO Song? “B-I-N-G-O ~ B-I-N-G-O ~ B-I-N-G-O and BINGO was his name-OOOoooo,” he sang the whole song and everyone clapped along. They loved it and some even joined in to sing with him. Then it was time for the games to begin! He and Papa had been sitting on that number for what seemed an eternity; and that’s a VERY long time. He won chocolates! Now, they didn’t know he’s not supposed to have chocolates, but he loves them so much he was smiling! When BINGO was over we went for a nice lunch at Holy Cannoli’s. This place in Worcester makes the best sandwiches and pastries. It was a fun day and Briana LOVED the chocolate treats when Papa opened them to share with her and the grandkids. This made EVERYone smile with the taste of chocolate dancing on their tongues. I hope this finds you smiling too! Enjoy a beautiful day! 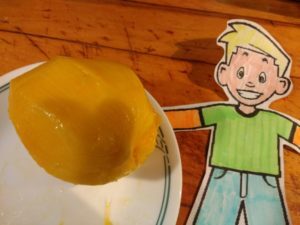 Flat Stanley woke up in a pretty good mood, but his mood got way better when Nana pulled a BIG Mango out of the fruit bowl. 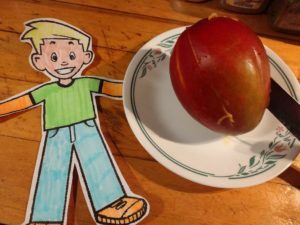 Flat Stanley’s eyes lit up and his mouth began to water as Nana cut into the juicy fruit and he could smell the sweet mango scent in the air. 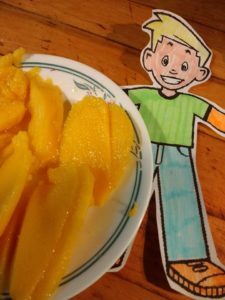 When Nana handed Flat Stanley an entire plate of sweet juicy mango, his smile lit up wide and bright! He devoured the sweet juicy fruit. Nana shared hers with Papa and everyone was smiling with this tropical taste on their tongues. This made Flat Stanley start the “Mango Tango Dance!” This is where your feet fly high and your hands clap under your knees. He wobbled his head from side to side and then broke into the slide. Side to side swooop, side to side swooop. Flat Stanley is a good dancer. He’s a good singer too! After Papa finished the dishes he spotted Flat Stanley in the corner jamming on his guitar. Papa pulled up a chair to listen. Nana and Papa were both enjoying Flat Stanley’s silliness and it brought a huge smile to their faces. I hope Flat Stanley brought a smile to your face too. Smiles are definitely contagious and we all need more smiling in today’s world. Please subscribe and Nana will send you an email when a new Flat Stanley Adventure is posted. Have a great day and share the smiles with others! Two Parties in Two Days? 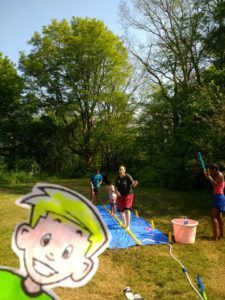 Flat Stanley is LOVING Life! Auntie Terri came over with a surprise for Flat Stanley today. “Two parties in two days?” Flat Stanley couldn’t contain his excitement. You know how he does it; he tucks his hands up under his arms like a chicken? Well he was doing that and flapping his wings. “Cluck Cluck little hens, I’m the one at the party again!” His smile was so big as he went to feed the chickens today! When everyone arrived, Flat Stanley got the drinks. The kids loved the Hi C as blue as the sea. Flat Stanley was showing off his basketball skills, Joseph and Blain were showing him how it’s really done. SLAM DUNK! Joseph was 20 feet from the hoop, and in it went. This boy has skills. 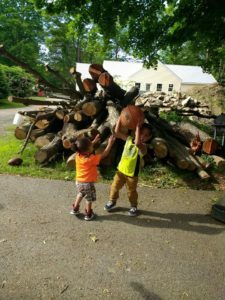 After shooting some hoops, they sat on the log pile beside the barn and found a little ant. Joseph named the aunt Adrien. Blain explained to Nana that the ant was a boy ant and that’s why the ant wouldn’t climb on Nana’s finger. The ant then went to play hide and seek and snuck inside the crevice, hiding from everyone. 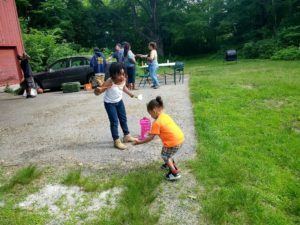 Then Nana came out with BUBBLES! You know how Nana loves her bubbles. Flat Stanley was playing with Promise and Blain. Promise would blow the bubbles and Blain would chase and POP them. POP POP POP. 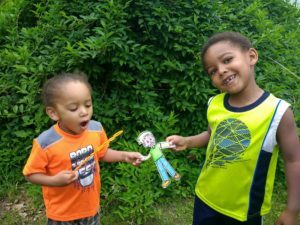 Flat Stanley had a lot of fun blowing bubbles with Joseph and Blain too. This was a fun party! Promise found the peony flowers on the property and her eyes lit up as bright as her smile. Nana let Flat Stanley pick one when he asked. The blooms are so delicate and pretty, just like Promise! Flat Stanley’s face was just a little red, can you see it. He was a little embarrassed, but loved the smile this flower brought to Promise’s face when he gave it to her. But today was all about Shay. It’s Shay’s birthday! Shay is Briana’s friend. 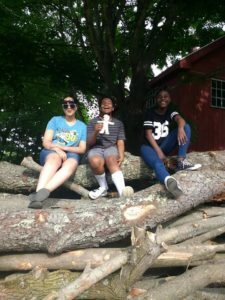 Flat Stanley LOVED hanging out with the birthday girl and the “teenagers” that were so cool on the log pile. Look at their beautiful smiles! I hope this finds you smiling too! Please subscribe, so Nana can send you an email whenever a new Flat Stanley Adventure is posted.